Frank Castle is dead. Call me... Gus Malzahn. * More bullets in our gun. Over and over this season we’ve heard the refrain: “Auburn is a one-man team.” And then came the Ole Miss game. No one seems entirely certain whether Dr. Gustav and company went to Oxford with the plan to sort of replicate what we did against Louisiana-Monroe a few weeks ago—intentionally hold Cam in the pocket and have him just dish and deal the rock to his increasingly-impressive supporting cast—or whether it came as a result of what Nix and the Ole Miss defense were doing, or some combination thereof. In any case, it turned out not to matter, because that supporting cast more than stepped up and showed its abilities and its potential for the rest of the way. Defensive coordinators across the land had to be wetting their pants at such a display. After all, the talk throughout the week building up to kickoff was, “How do you stop Cam Newton from running all over your defense?” Paul Finebaum must have asked some variation of that question to every single person he interviewed, chatted with, or bought a cheeseburger from last week alone. Sure enough, the Rebels (maybe) found an answer—and all they got for their troubles was another Auburn 500-yard performance, the fresh and now-healthy legs of Mike Dyer unleashed, and 51 points hung on their scoreboard. A one-man team? Georgia and Alabama wish we were a one-man team. Come to think of it, so do the last nine teams we’ve played. * More bullets waiting for Alabama. Malzhan revealed a few more cards from his hand at Oxford. We know from last year that he probably has five or six extra-special plays he’s keeping under wraps, specifically for Alabama. We speculate that they are currently locked inside a triple-reinforced, lead-lined, adamantium/vibranium alloy box, designed to protect the mere mortals inside the football complex from the massive gamma radiation emitted by their sheer brilliance. It goes without saying that we’re very much looking forward to seeing them in action. * The three favorite topics during the BCS show. During Sunday’s BCS rankings show—which, incidentally, proves that ESPN can make a big, dramatic production out of anything—three main topics consumed most of the airtime: 1. Oregon sure is great! And, as a corollary to that, Auburn needs to be winning with “style points.” 2. Alabama is a real threat to get into the National Championship Game! 3. Cam Newton is NOT a lock for the Heisman! Topic 1 is understandable. Oregon’s offense is remarkable (though we have to think that at least some Duck fans are saying the same thing about Auburn’s) and more than deserves all the attention it’s getting. And they did jump Auburn for first in the BCS rankings. To say Auburn should be winning with more “style points,” however, strikes us as absurd. The Tigers have rung up multiple games of 500+ yards of total offense, including shattering LSU’s all-time ground-conceding record. They’ve pasted 65 on Arkansas and 51 on Ole Miss—you know, two teams from the SEC West, called by many the toughest single conference/division in all of college football. This past weekend, they unleashed a rookie running back for nearly 200 yards, tore off a long kickoff return for a touchdown, and even demonstrated Cam Newton’s (remarkable) pass-catching skills as he scored a touchdown in yet another manner—as a receiver. Tell us that Tommy Tuberville’s 2006 squad needed more offensive flair and we’ll wholeheartedly agree. Tell us that this Auburn team lacks style and we will call you a raving lunatic. The third topic—the trophy isn’t Cam’s quite yet!—reflects ESPN’s desire to provoke and promote argument with regard to the Heisman for the simple reason that it’s rarely been this much of a runaway so early in the season, and they get a lot more talk-show mileage out of a big debate than out of a done-deal. It’s simply no fun for their shows or for their commentators if they are forced to admit that the race is already over. Honestly, that’s probably a good thing for Cam, or at least for Auburn. It keeps the subject of the Heisman (and Cam) on people’s lips a bit more than if it were considered a total fait accompli and the subject were ignored the rest of the way. Now let’s look at that second topic. My goodness, but you could hardly turn on sports-talk TV or radio over the past couple of weeks without hearing umpteen scenarios for how and why Alabama could and should make the BCS Title Game. The intricate justifications which are always included involve the SEC’s strength as a conference, Alabama’s loss occurring early enough in the season for the Tide to have “time to recover in the polls,” the semi-“perfect storm” Alabama walked into in Columbia, and their fearsome reputation as defending national champions with last year’s Heisman winner. Taken as implicit in every one of the scenarios, however, is Alabama defeating three foes with a combined record (as of this week) of 23-3! That includes, of course, beating undefeated Auburn on the day after Thanksgiving—and, indeed, the perception here is that most of the national sports media members seem to strongly favor Alabama in that contest. They are of course welcome to favor whomever they wish for that game. This can, however, be turned to Auburn’s advantage. Even when Auburn was (briefly) ranked first in the BCS last week, and as many talking heads fretted over whether the young men who make up the team could stand up to that kind of pressure, the prognosticators were still largely talking about ways in which the Tide could and would make it to the SEC Championship and the BCS game. In other words—just because you’re ranked first or second, Auburn, doesn’t mean the human voters have confidence that you will go all the way, guys. You’re still the hunter, not the hunted. You are still the team with something to prove to the country. There is and should not be any complacency on the Plains. Motivation aplenty is available. Just listen to the commentators still dreaming of finding a way to put Alabama into the big post-season games instead of you, and get all fired up about that, and then take those feelings out on the Dawgs and Tide. 1. The aforementioned bullseye now hovers over Eugene, Oregon, instead of Auburn, Alabama. We would much prefer to play in a potential national title game as the hunter than the hunted. The only downside is that the Tigers would be wearing their all-whites instead of the best uniforms in college football. And the Ducks would be wearing one of their 8,000 eye-gouging combinations that look like the Jamaican flag melted over a steel girder. 2. Motivation for our team. You’ve been dissed by the BCS, guys! If you make it to the end and get to play in Glendale, take out that resentment and anger on the opposition! 3. In the event that Alabama should win the Iron Bowl, they’ll want to receive as much benefit from such a victory as possible in order to jump over the undefeated but non-AQ teams ahead of them. Beating the #2 team isn’t quite as impressive as beating #1. We will admit, though, that this “benefit” is somewhat akin to hoping the shark that eats you later develops severe heartburn. * Defense Wins Championships. Right? We’ve all heard that old saying for most of our football-watching lives. But, for the first time, we’re starting to question just how true it is, or at least if there can ever be exceptions to it. The idea is that defense is more important in the long run to a championship-seeking team because strong defense always shows up, while in some games a good offense has a bad day or is stymied by a smart defensive game plan. Here’s the problem with that, at least with regard to this year’s Auburn team: This year, ever since it found its stride after Clemson, our offense always shows up. It shows up, and it erases mistakes—mistakes by the defense, the special teams, and even by itself. In the Ole Miss game, the Rebel Bear Calamari creatures employed a completely different offensive approach (according to Ted Roof) than they had used previously this season. It didn’t much work. Even if it had, though, their offense would have had to score at least 52 points to win. They’d probably have had to score even more, in fact, because our offense wouldn’t have spent much of the fourth quarter slowing the game down and running the clock—they’d have approached the situation more like they did against Arkansas, just keeping the pedal to the metal and racking up an inconceivably insurmountable lead. Maybe in a different year—even last year with that great Alabama defense—there would be more cause for concern. But this year we simply don’t see a dominant defense on the scene that appears capable of totally shutting the Auburn offense down. Or, to be fair, Oregon’s offense, either. * There’s a column to be written about a hypothetical Auburn-Oregon matchup, with all the fireworks that such a thing would imply. And if fate smiles upon us in a way it hasn’t upon Auburn in decades, we’ll be able to write that column soon. * We’re beginning to think Alabama fans would trade losses to LSU and Miss State for a win over Auburn. Don’t believe us? Just listen to the Finebaum program for any thirty-minute stretch this week. Then again, why subject yourself to that? Just believe us. The problem is, we’re not entirely sure Alabama Fan understands that. * The party of the elephant is, paradoxically, great for the Tigers. Finally, in this election week, a teaser for a longer article to come from the Wishbone in 2011: Auburn football always does better in years when the Republican Party is rising or in ascendance. Alabama, conversely, has enjoyed its brightest football days when the Democratic Party was dominant. We of the Wishbone make no representation here about our own political views, or about the parties or candidates themselves. That entire side of the matter is wholly irrelevant to our purposes here. We merely present the (quite bizarre and inexplicable) fact that having the party of the elephants and the color red in ascendance tends to (paradoxically) result in Auburn doing much better on the football field than the Tigers do in the years of Democratic dominance. From Shug’s greatest teams during the Eisenhower years, to Alabama’s titles in the 1960s and 70s under Kennedy, Johnson, and Carter, to Pat Dye’s glory years coinciding with Reagan’s, to Alabama’s last two national titles coming during the first years of Presidents Clinton and Obama… it’s strange, yes, but very true. So as we watch the outcome of this year’s elections rolling in, and as we see the big Republican wave of victory across the US, we of the Wishbone have to admit a completely non-political happiness about it. This could be just the omen we need to guarantee a crystal football coming to the Plains in a few months. Or it all could be complete garbage. Who’s to say? We’ll find out in January…! While it is true that Cam does possess the Power Cosmic, likely from a heretofore undocumented encounter with Galactus, we have ascertained that, during that play, he was busy rescuing the entire population of a town in Albania after its local dam broke, as well as pulling Timmy from the well. Sometimes even touchdown-saving tackles must take a backseat to the lives of thousands of Albanians (and Timmy), whether we like it or not. Alabama edges slightly ahead of this pack, though it’s a real jumble at this point. The LSU-Bama game on Saturday will tell us a lot. Miss State has become a real threat to beat Alabama—who saw that coming in August, or even in September? Bama’s schedule suddenly looks tougher than ours—they play at LSU on Saturday, then home against Mullin’s Dawgs, and then (after the Curry Bowl) the Iron Bowl. Miss State could move past Arkansas and even LSU in the bowl order for SEC teams before all is said and done. Wow. Florida edges ahead of UGA by edging past them at the Cocktail Party (and don’t you imagine there was a good bit of drinking going on after that game, by both fan bases—but for entirely opposite reasons?). Poor Kentucky—we can’t shake the feeling that they’re a good team; with just a little more defense they could be a serious contender, at least in the SEC East. Welcome to the bottom, Vols. Yes, it has come to this. But just remember: You have that famously lightweight UT November schedule with which to try to salvage…well, something. Very good stuff as usual. That Punisher shot of Gus is awesome. Style points? In the freaking SEC? Give me a break. It’s true about Cam not making that tackle. I think I heard something over here about some Albanians somewhere being rescued by a mysterious dark stranger wearing a blue and white suit with a white helmet. It would have been about midnight over here when that happened, so there was some confusion about who/what this mysterious rescuer was. Or at least that’s what I’m going to start telling people, now. Would love to see Auburn break out a wishbone formation against Alabama. Cam, Michael and Ontario in the backfield. Well, newton did make the tackle after he fumbled on the handoff. Almost stripped the ball out too. Upon further review the video evidence suggesting newton gave a wristband or two to the chain gang was inconclusive. All parties are innocent until proven guilty. The ruling on the field stands. But because newton is so awesome we will penalize him to eat cotton candy on the sidelines during garbage time. Thor, consider me a contributor to that fund. I think you guys might be a bit confused. Cam didn’t make the tackle BECAUSE of the cotton candy as the opposition had laced it with kryptonite, leaving him unable to be in more than two places at once, which is why the wristband was given away, and was also the only reason that Cam didn’t catch his OWN touchdown pass. It was actually the ref wearing the wristband who saved the Albanian kids, as the wristband had soaked up just enough Cam Power to enable short bursts of Cam like ability. In other news, that ref can now accurately call a coin toss up to twelve minutes before it is thrown, sense a penalty from miles away no matter what the sport, and often leaps his own hedge row when he gets home at night. Covers.com said Auburn would be an 11-point underdog in a national title game against Oregon…something about our defense…blah blah blah. I was shocked until I looked at how The Model predicted Vegas would react to that matchup. The Model said Auburn would be a 9-point underdog against Oregon. At least no one can say The Model has a pro-Auburn bias. Frank Castle is dead. Call me… Gus Malzahn. 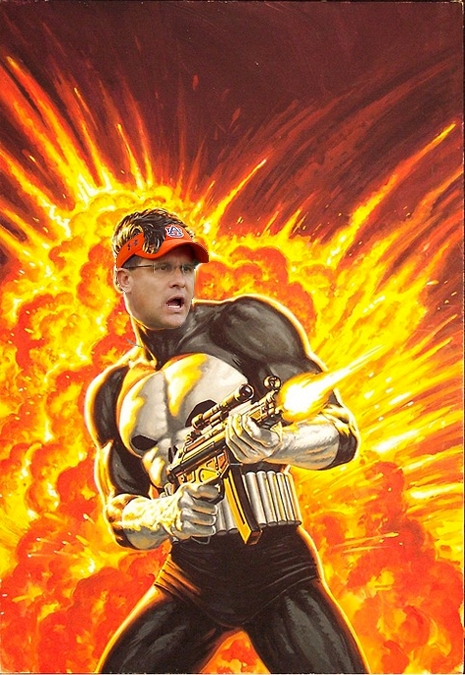 Given the title of the article can we call him (at least for this post) “Guns” Malzahn? No more crystal football trophy at our games. While I actually sort of like the attention that brings to our program, John wisely points out the massive bad juju inherent in having it sitting there during a game. Good riddance– until January, maybe? we are right there with you! originally we were going to call this “Bring back the Wishbone” but we just shortened it. I am worried that Van might have a heart attack from joy if Auburn lined up in the wishone with those three guys against bama. And Van is right – I don’t want that crystal football anywhere near us until we get to keep it.